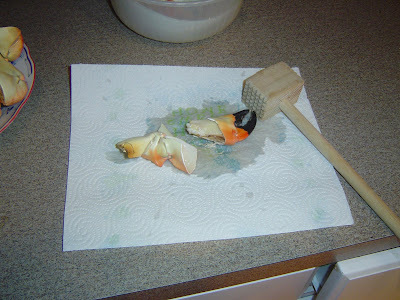 Kitten with a Whisk: Stone Crab Season! Even as a kid I loved seafood. I suspect it’s because I was raised eating steamers, clam chowder, and lobster among other fish and shellfish. 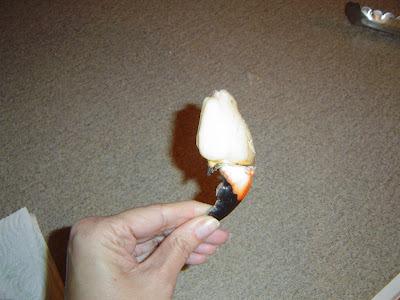 Stone crab season is from the middle of October to middle of May. It is the only time that their claw can be harvested. The claw will grow back in about a year. They are considered by many a delicacy, and I assume this is because they aren’t available year round. I try to enjoy them at least once or twice a season. 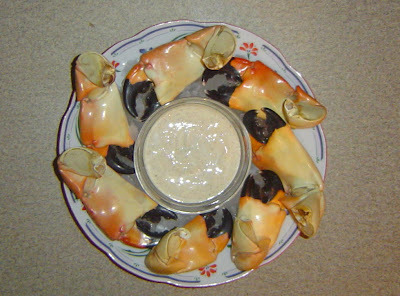 Stone crab is commonly served with a mustard sauce. Usually it’s a mayonnaise based dip. Since I don’t groove on mayo, I created my own version. It still has kick, is very easy, and it doesn’t have to be used on just seafood either. 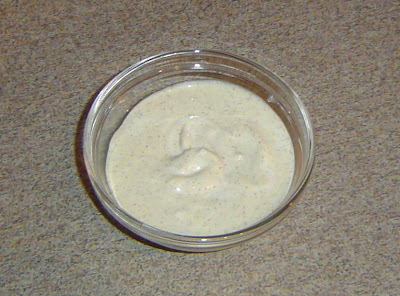 Preparation: Take equal portions of the sour cream and mustard and mix together. Add a pinch of salt and a good amount of freshly ground black pepper. Mix again. Then settle in with a mallet and get to work! Its a messy job, but someones gotta do it! To serve stone crab, the best way is to serve chilled over ice in a shallow dish. I prefer crushed ice and then put the sauce in the center. This is about a pound of stone crab. I was planning on having it as an appetizer for dinner that night, but I lucked out and BD was working and our roommate went out so I got to enoy these bad boys all by myself.